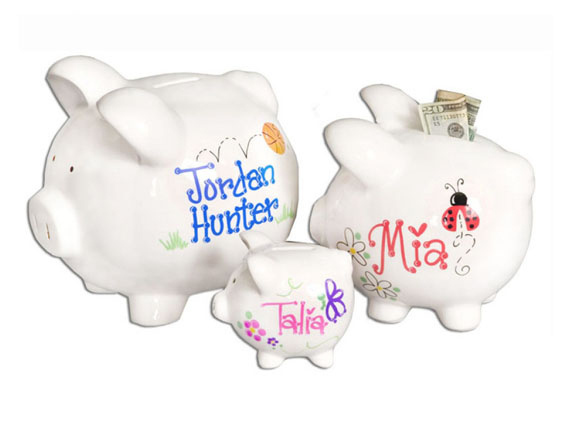 A personalized piggy bank is cute, not too big (even when it’s a jumbo one) and will come in handy in a few years for depositing coins from the tooth fairy. Giveaway sweepstakes is open to all residents of the 48 Contiguous States and only to those 18+. The full list of rules can be found here . For a full description of the available piggy banks, you can go to Baby Gifts & Gift Baskets. Sweepstakes ends at midnight EST on February 17, 2013. The sweepstakes winners will be announced by February 21, 2013. This entry was posted in Giveaways and tagged giveaway, jumbo personalized piggy bank by jessica. Bookmark the permalink. i like baby books usually spend about 30! i like to give blankets! I like to give baby essentials like soap, lotion, and first aid items. I always give books and educational toys, The amount depends on what sales I find. I like to give whatever is in my gift closet. I love your Gingham & Giggles Twins 3 Tier Diaper Cake. I have never given one of these but I have always liked when they were given. My best friends daughter is having twins so this would be great. I usually spend about $50. I love to give diapers! and I normally spend about $15-$20. I love the baby toy alphabet letters and numbers! Usually I just give a gift card. They are always appreciated. Diaper Cakes, make them myself. My favorite gift to give (or receive!) is cloth diapers- but obviously only if they plan on using it. Otherwise, I like giving swaddle blankets, nursing covers, and personalized items if possible. How much I spend depends on how well I know the person! I usually spend upwards of $30–I like to give books, a cute outfit, and something practical, like wipes and diapers. I like to get those same things! I like to give diapers, around $20.